AFWG Education Module 4: Is Antifungal Susceptibility Testing Useful for Clinical Management? AFWG Education Module 5: TDM of Antifungal Agents - Essential or Optional? Do We Need Modification of Recent IDSA & ECIL Guidelines while Managing Patients in Asia? AFWG shall not bear any responsibility for any content on such sites. Any link to a third-party site does not constitute an endorsement of the third party, their site or services. AFWG also makes no warranties as to the content of such sites. Don’t show me this again. Zheng S, Ng TY, Li H, Tan AL, Tan TT, Tan BH. Mortality for candidemia ranges from 15% to 35%. Current guidelines recommend inoculating blood into three aerobic and three anaerobic blood culture bottles when candidemia is suspected, without mention of a fungal blood culture bottle. To determine the value of the BACTEC Myco/F Lytic blood culture media in the diagnosis of fungemia. A two-year retrospective cross-sectional study was performed for patients who had fungemia with submitted BACTEC Plus Aerobic/F (Aer), BACTEC Plus Anaerobic/F (Anaer) or Myco/F Lytic (Myco) blood culture bottles. The detection rate of fungemia was 77.4% in 93 patients with contemporaneously submitted blood culture bottles when limited to only Aer/Anaer culture results. The detection rate improved significantly with the addition of the Myco culture bottle results (p<0.0001). A logistic regression model showed that Myco culture bottle submissions were less useful for patients with appropriate anti-fungal therapy administered within 48 hours [OR = 0.18, 95% CI = (0.06, 0.49), p = 0.001] and those with fungal growth detected within 48 hours [OR = 0.33, 95% CI = (0.12, 0.89), p = 0.001]. Among a subset of patients with concordant blood culture results, those with Myco culture bottles submission allowed earlier fungal detection and speciation by at least one day in 27.5% and 25.0% of the cases respectively. 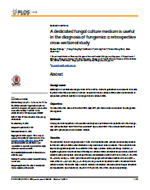 Our study highlights the importance of a dedicated fungal blood culture when fungemia is clinically suspected. Nearly a quarter of fungemias may be missed if a fungal blood culture is not performed. Copyright © 2016 The Authors. Published by PLOS ONE. All rights reserved. Reproduced with permission. This field is required. Please enter your email address. Thank you for signing up for the AFWG newsletter. You have previously subscribed for AFWG newsletter.